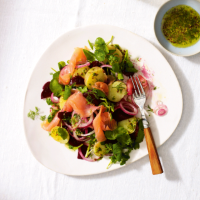 Vibrant and earthy, beetroot makes a bold statement here but the subtle oak-smoked salmon and herby dill add a beautiful contrast for a well-balanced dish. 1. Cook the potatoes in a pan of boiling water for 15-20 minutes until tender. Drain and thickly slice. 2. Meanwhile, place the red onion in a shallow bowl and pour over the white wine vinegar. Set aside for 15 minutes. 3. Arrange the warm potatoes, beetroot and watercress on a platter or four serving plates. Drain the red onion, reserving 1 tbsp of the vinegar, and scatter over the salad. Tear the salmon into wide strips and arrange on top. 4. Using a fork, whisk together the reserved 1 tbsp vinegar, olive oil, honey, mustard and chopped dill. Spoon the dressing over the salad, scatter over a few extra sprigs of dill and grind over some black pepper to serve.